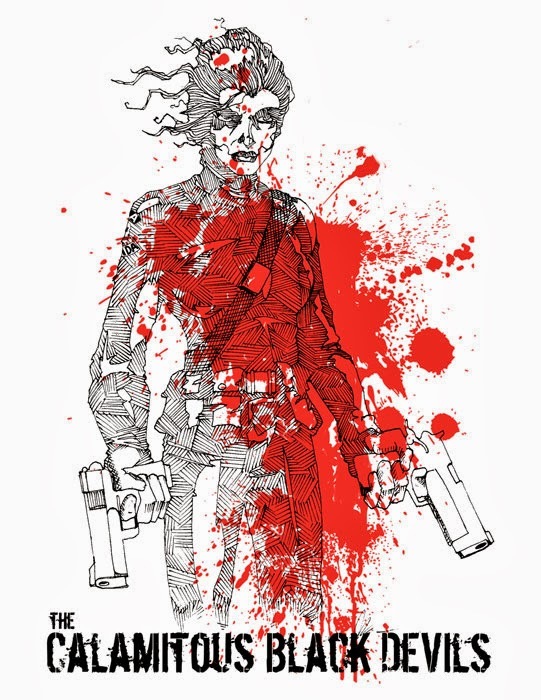 Forces of Geek caught up with some amazing creators at the recent Rhode Island Comic Con, and one of our favorite books from ComiXology Submit was there! Today we talk with Joseph Schmalke about Kickstarter secrets, his classic influences and the many reasons you should check out Calamitous Black Devils on ComiXology or wait for the trade in May of next year. Forces of Geek! : Thanks for taking the time to talk to us today. How was your Rhode Island Comic Con? Joseph Schmalke: Rhode Island was a lot fun it had a great crowd. Also Rhode Island was one of the better set up conventions I had been to this year. I’m definitely going back. 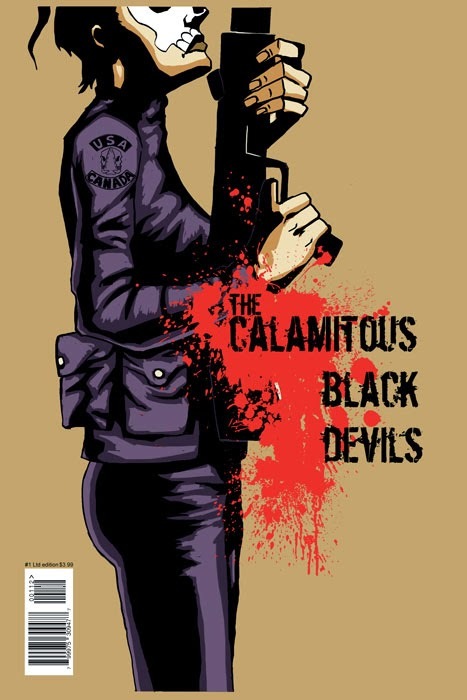 Your book Calamitous Black Devils, issues #1 and # 2 are out now. There’s a ton going on in the book from war to zombies, magic and zombies! How can you describe the book to new readers? It’s a World War II story where an elite brigade of army operatives go behind enemy lines to stop the Nazis from opening a doorway to another world where an ancient god lives that can raise an army of the dead. They succeed in stopping the doorway from opening but get sucked into it and find themselves scattered about a planet at the center of the universe. Now they have to find each other to get home but first they have to battle through hordes of the undead, aliens, mutants, and ancient gods. Plus it’s got plant human hybrids, space vampires, werewolves, and Nazi zombies. Who are your main classic comic creator influences? By that I just mean Issue #1 I was sensing Joe Kubert with a Sgt. Rock vibe and Issue #2 I was feeling Lee, Kirby and Ditko! I grew up on Conan, Sgt. Rock, and The Punisher. My father loved those books and was always raving about them and then lending them to me to read. So yeah there is a lot of influence there. For art it’s Frank Miller and Mike Mignola. Their style and art speaks to me. As far as writing goes Warren Ellis, Neil Gaiman, and Alan Moore. Right now I’m reading just about everything Valiant puts out as well. How many issues will Calamitous Black Devils run? Only 4 issues of the 6 will be printed at this time. Tell us about the collected edition due in May! Broken Icon Comics has picked the book up for publication. They will be taking the 6 issues and making one book that is 180 pages long. This will be book 1 of the Calamitous Black Devils story. It will be available at Barnes and Noble and some other retail outlets as well as on Amazon. Broken Icon stated they will be pitching it to Diamond Distribution. How are you involved with Broken Icon Comics? At this moment I am an independent contractor. Broken Icon Comics has picked up this book and hopefully it goes well enough for them that they will pick up some of my other future projects. We always ask…how was your Kickstarter experience? Looks like the campaign exceeded its goal. Nerve-racking until the goal was met…then it was fun. Before I made goal I thought it was never going to happen despite pestering my friends and family. You have to pester a lot of people into backing and spreading the word about the project. A few of my friends were happy enough to broadcast the project through social media. The guys from Coast City Comics in Portland, Maine were very supportive before and after the campaign was done. What was your secret? We hear the video is really important. Also, how important was the comics community support to funding your project? The secret is hard work and self-advertising. You have to believe in what you are doing or no one else will. The video of course is very important. I had the help of dear friends who work in film. I shot the thing on a camera phone and sent it to them. They gave my video a film like quality using editing equipment. Also as I mentioned before I had support from Coast City Comics. Those guys posted about the project on their Facebook and twitter feeds. That meant that all the comic book readers that go to them knew about the project. People like to see a local artist succeed. Number one advice for a Kickstarter comic from your experience would be…. Rewards are the key. People might want your comic but it’s always great to give them something more and something unique to the campaign. Also making personal rewards is a great way to get people involved. You draw someone in your book and they shout from the heavens about the comic because they are in it. What’s next for you? Another Kickstarter? 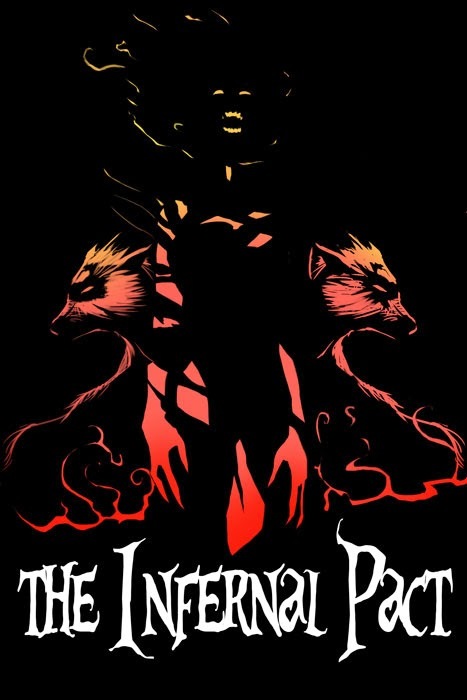 Taking a few months off to work on my next project titled The Infernal Pact before the Calamitous Black Devils book #2. Going to give them a little while to calm down after the events of book #1. Could be a possible Kickstarter for the Infernal Pact. Be sure to follow Joe on Twitter at @josephschmalke for the latest news and be sure to check out www.josephschmalke.com and check out the Calamitous Black Devils Facebook page.